With Easter coming, and my love of this season of rebirth and renewal and of course chenille chicks, I thought I would share with you our family tradition of egg decorating. You’ll see we’ve got a couple of different styles, more of a generational thing. I adore them all completely!!! My mom passed these along to me when she downsized a couple years ago. They’re made by my sister Pam, little sis, Missie glued to her side watching every single delightful crafting moment! 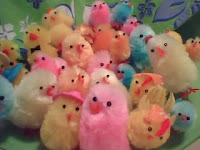 If you want to make your own for Easter, now’s the time to find the chenille chicks, though sadly they are no longer as festively dressed as they were back in the day. I have been toying with the idea of fashioning little outfits and accessories for the no frills chicks sold these days… back to the directions, the egg, when you pierce the eggshell to remove the egg, use a pair of curved cuticle scissors to cut the hole. It makes a nice round cut. Also do this (enlarge the hole) when the egg is still wet or it will shatter into a million pieces. The paint she used was the little bottles of enamel paint that they sell near the model kits in craft stores. It dries quite hard and shinny, she usually painted the inside a different color. I’m not sure if you can tell from the picture, and these cuties have been around for AWHILE, but there is flocking on the outside. So if you’re going to do something like that, you’d want the undercoat of paint to match the flocking, which was applied by painting the egg with white glue (now-a-days I would go for the acid free/non-yellowing type) and then rolling the egg in the flocking. You can see a detailed view of the trim used to cover the edge of the egg opening. It should also be noted that while I have them all nested here to photograph them, you may notice some are made to hang like a little basket, others have a bail at the top, but they are all meant to be hung from a little tree or branch as a center piece or on a side table. If you really love this craft, like we do in our family, you can take the same idea and make really beautiful Christmas ornaments. They’re lovely with a simple nativity scene or angel nestled inside. These beauties were made by my Aunt Millie, she really had an elegant flair. It’s times like this when I wish I had a video clip to really show you the detail of these eggs. Nearly all of them are hinged with little doors. They’re all lined with fabric and there are all these special touches, cherubs dangling from a delicate chain, a blue forget-me-not nested in the bottom of velvety richness, everything elegant. Not too much, just the right amount. I hope you enjoyed looking at our little nest of eggs, now I’m off to go fashion tiny top hats out of felt!!! Last Saturday I attended my first official meeting as a member of the Spinners Flock Guild. It was especially nice because my friend Jan was doing the program on angora spinning and because the weather was just wonderful! I met Jan the first time I went to a Fiber Fair about three or so years ago, I was with the spinning group from City Knitting and bought some of her angora fiber. And we became friends over the ensuing years as we talked about angora rabbits, gardening, organizing, knitting, spinning… and of course I am happy to have a source of angora fiber! If you are interested in angora fiber, I would be delighted to put you in touch with Jan. In response to the knitting needle organizer I put together using a tote, Jan has told me about the unique organized holders she has come up with. We have been trying to get together at one of the Spinners Flock meetings, but the winter weather just would not cooperate! Saturday’s drive was wonderful and I was finally able to see what Jan was describing to me, I think you’re going to love her ideas! I especially love how she used the old blue jean pockets and legs. With the legs that have been made into needle holders, I’m not sure if you can tell from my photograph, but there is a flap of cloth that folds over the top to keep the needles safe, and then the whole thing can be rolled up like a tube. The other detail I wanted to point out is where she embroidered the size of the crochet hook on the slot on the outside of the pocket for each of the crochet hooks. And the bunny potholder has been re-purposed to hold those chubby knitting needles, how cute! It’s a very clever way to reuse and I can see where these ideas will help me get my knitting needles even more organized. Plus, who doesn’t have old blue jeans waiting to be re-purposed into something else? At the meeting, I bought some more white angora and some beautiful soft, blueish black lama/mohair blend that will make a nice shawl. Jan had some really good tips for spinning angora, and spinning in general, for example she recommend leaving your yarn on the bobbin overnight to “rest” in between spinning and plying or whatever your next step might be. Good to know. 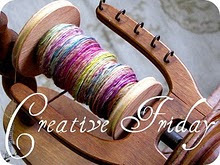 I’ve got some yarn on the bobbin right now, I’m spinning some beautiful Caribbean blue angora my friend Kim sent me. She and her hubby Kevin and their two boys (well one is just a baby, so I’m pretty sure he’s kind of a freeloader for right now…but it wont be long!) raise Alpaca and she has been very generous to me with gifts of fiber! When I get it plied, I’ll post a photo. It’s been a good spring week! It’s my girly cat Cissie’s 12th birthday today and she’s such a good and funny friend to me I thought I’d share a cute picture of her and her brother Duncan. This picture was taken at my old apartment. My eyes have gotten used to Cissie, so I am always surprised when people ask, “Do you still have that great big calico?” I have to laugh because compared to her brother she is very petite! Duncan, no longer with us, toped out at 26 pounds and from the tip of his nose to his hinder he was two feet long! The Mom of these two? Believe it or not, a tiny black and orange tortoiseshell, named pumpkin, who probably only weighed about 6-8 pounds soaking wet. Speaking of soaking wet, when they were kittens, I thought I might get them de-sensitized to baths by starting them early…RIGHT! Cissie was less vocal than her brother, whom you would have thought by the sound of it, was being run through a sausage maker! I can still hear the ROWWWERRRRR! Now I know this bath thing made a Huge impression on the smaller but smarter Cissie. My sister had given the kittens tiny stuffed toy cats just like themselves a calico for Cissie and a butterscotch colored stuffed toy for Duncan. One day I came home, and what do I find but little baby (toy) Duncan floating face down in the water dish. And I thought, oh, one of the kittens must have accidentally flipped it into the water dish. I fished it out, and washed it and clipped it to dry by the tail from this garment rack in my dining room. I knew it was more than a coincidence and that Cissie was seriously frustrated with her big toughie of a brother when I came home and found “little baby Duncan” floating face down in the toilet!!! It startled the heck out of me, because at first I didn’t recognize what it was! Just this floating wispy orange thing. Then the dilemma, ditch little baby Duncan, flush him, fish him out and wash him? Well, I fished him out and because I could not imagine throwing him away, so I washed him a few times. And always made sure to check the guest bathroom after company to make sure the lid went back down! No more deep sea adventures for “little baby Duncan”, no matter how annoyed the bossy miss Cissie gets! And she is bossy! Once, when Duncan was still around, out of the clear blue, he started taking over her favorite spot. Well this spot was really high, I had a small apartment, and a love of antique furniture and tag sale finds, so I had started stacking tables and chests. Cissie’s perch was on top of this cool primitive cupboard with lots of little cubbys and drawers, the problem was that on top of the cupboard was a collection of plaster angel statues and a candelabra. So by the time Duncan bounded up on the two tables and squoze his caboose into Cissie’s spot, it was like a minor earthquake had taken place. I was worried that eventually there might be more than just a whole lot a shaken goin on, and I might end up with some fatalities in the statue neighborhood if I didn’t take matters into hand. So I moved a few things around and made it inaccessible to the jumpers. Cissie was miffed, if we lived in cartoon land there would have been a little dark storm cloud over her head! This went on for a couple of days, then one day I was sitting there and she came over by me and sat right down in front of me, and I swear to you it’s like she used her kitty mind meld on me. Because I said to her, what’s up Ciss? And I could tell she wanted something, she was so intent as she looked at me, What’s up ciss? And I leaned a little closer. Then I asked her again, Cissie, what’s up? And I leaned right down by her. And THAWK,THAWK!!! She cuffed me right up side the head, TWICE!!! That little dickens was mad that she couldn’t have her spot, she got her point across! She’s really is a sweetie, funny little gal. Happy Birthday Cissie! I’ll catch up with you folks on Friday, have a great rest of the week! I was introduced to Artist Trading Cards not too very long ago at one of the craft groups I've been getting together with. One of the ladies was kind enough to show me many of the cards she had made and received in her years of swapping cards. The idea being to create these little works of art the size of a baseball card (2.5"x 3.5"), often there is a theme and of course there is a deadline. So you may be required to make 6 cards in a theme, and receive 5 in return, because the coordinator of the swap retains one of the cards as a sort of payment for the work of organizing the swap. It's quite fair I think. It's fun, though I can see that while I enjoyed it, I'm also not going to go nuts swapping ATC's as their called. I have a lot of hobbies already with projects in the queue calling my name! What did intrigued me though was the smallness, I love to make tiny art. This is my first swap, I got in just under the wire about a week before it closed. 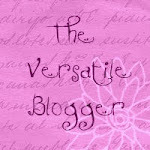 When I tell you the name, you will understand why I was willing to rush my project to participate..."Think Pink!" All the cards I received in return are magical! The tiny purse stole my heart, it actually opens and inside are itsy-bitsy dollar bills!!! The piglet is a little water color! There is one done with beautiful hand painted paper and embellished with all these intricate trinkets that don't really photograph all that well, but it's really cool. I love the pink and white Victorian house, those arched windows remind me of the house I rented an apartment in before I bought the home I live in now. I should show my former landlords how lovely their home could look if they ventured away from the dull brown and tan they have now! ahahaha! The last card is all done on pink glitter paper! Well you know you can't go wrong with either!!! hahaha!!! If you're interested in swapping ATC's, I believe there are a number of groups available through yahoo, I know there are groups everywhere, but yahoo is where I found mine. Just go to yahoo search and type in atc or artist trading cards and join a group that looks promising. The nice thing about it is, you can participate as much or as little as your schedule allows, you have the opportunity to make friends from all over the country and the world, and you get to give and receive these amazing miniature works of art. It's So Nice and "Gardeny" Out Today! Last season I put raised garden beds in my yard, one for strawberries and two for herbs. The strawberry bed is 4'x4'x11', this was a little bonus because originally I ordered a 2'x4' bed for the strawberries, but when my order arrived there seemed to be a lot of 4' lengths. I had ordered a 2'x2' and a 2'x4' and as I sorted out the order, I was sort of pep-talking myself, alright Melissa, you can figure this out...because there were only two, 2' lengths and the rest were 4'. I just kept thinking, there's got to be a way...finally I called the company I ordered from, www.naturalyards.com, the kind folks at Naturalyards got it all sorted out. They expedited the shipping on my order and I had the rest of my raised beds in no time flat! Plus as a truly unexpected bonus they told me to keep the extra 4'x4' bed!!! I highly recommend them, not just because of the excellent customer service, but because their product is wonderful! The beds look so nice and are so easy to put together and are very affordable. I checked on my strawberries, guess what! Even here in our cold winters they're still green under the mulch! The only thing I really did was swap off the straw a couple-three weeks ago when it got completely soggy with all the rain and replace it with fresh. I could see the plants peeking through all that wet straw and I was worried that if/when it froze again my plants would be vulnerable. Plus all that wet can lead to rot, so fresh straw dressing for the raised beds it is. Not to worry, the old straw went to the composter. In fact, when I scooted out to take pictures today, the under-straw was a little damp on the bottom, since it was so nice and warm today, I flipped the mulch, so the slightly wet stuff could dry off. I don't know if this is overkill, but those plants are my little friendy-friends, I want to do well by them. I am trying to decide if my petite yard can hold one more (2'x4') raised bed and still have room for the mosaic fountain I am planning to make out of the giant planter my Dad salvaged years ago from somewhere ( I believe it came from our local shopping mall, see if it looks familiar to you locals)...the great thing about the raised beds, if I need to I can rearrange them. The variety of strawberries I planted last year are called, Mara Des Bois. I ordered them from www.whiteflowerfarm.com. The berries are as delicious as the plants are beautiful and when they say it, "throws vigorous runners" they weren't kidding! I pretty much had my strawberry bed filled the first season! I feel so bad cutting off all those babies...and just throwing them away. I was excited to see that they now have the variety I have been searching for, Fraises Des Bois, I'm definitely going to order some of those. I love White Flower Farm, I also ordered some pink lilly of the valley from them last year, I'll be watching for them to come back and hopefully spread! Happy, "getting ready to garden" everybody!!! I would love to hear about your favorite plants or garden additions, send me an email if it's too big to post as a comment!